Clara had her six month follow up with surgery today (the first of several appointments this week), so we were back at the hospital and after meeting with Dr. Turner, we headed back to the NICU/PICU to see some of our other old buddies. I have to say, I've just been replaying the morning over and over again in my head all day today. It's such a testament of how far we've come and I just can't stop thinking about all the people who helped get us here and who we came to truly love along the way. I trust and respect their opinions so deeply, so it meant a lot to hear them all 'ooh' and 'ahh' and say how great Clara looks and how well she's doing. In a strange way, I kind of miss sitting in on rounds, sharing what I think has happened and how she's doing and where we might go from here. I don't miss the sickness or the fear or the worry, but I kind of miss this family of people who loved Clara (and us) like their own and whose commitment to quality care is one of the big reasons she's thriving today. Dr. Petty said today, "Clara is really the exception, not the rule. It's so great to see a baby who didn't just survive, but is truly thriving." We're reminded of how incredibly miraculous her recovery was. Part of our hearts belong to these people, and they always will. Here are the two men who deserve most of the credit for saving Clara's life. Dr. Petty put Clara on ECMO in the wee hours of the morning on her second day of life and was her primary surgeon who followed her (and carried us) through her 78 days at Brenner. He's the one who had to break the news to us that he didn't expect her to live and he's the first to give credit where it's really due - even today he said, "This one was all God." 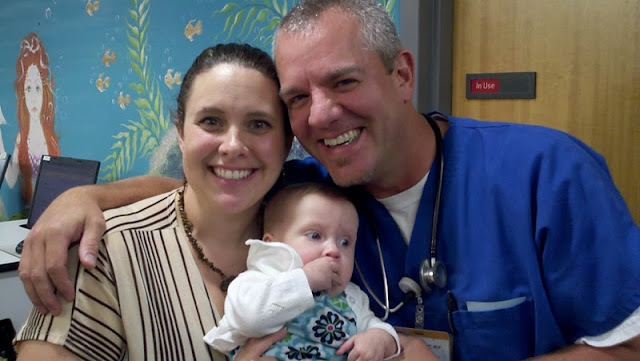 Dr. Turner did Clara's repair surgery and also took her off of ECMO and for those two big days he will always hold a special place in our hearts. 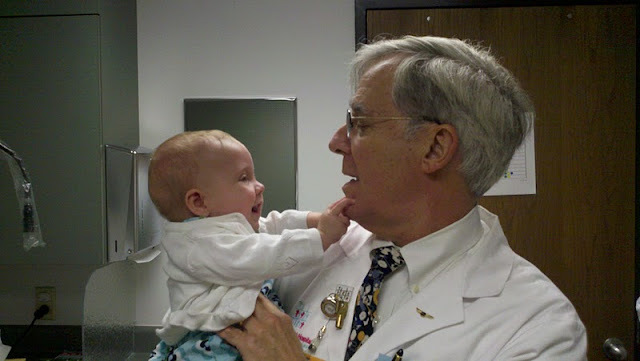 He's been performing surgery on babies for decades and we're so thankful for his expertise, his wisdom, and the care and compassion (and sense of humor) with which he handled us during those days. Our hearts always swelled with hope and comfort whenever we saw Dr. Turner coming. These two men rock our worlds. Remember Dave? He believed in Clara when nobody else did. He pushed the physicians to "cap her off" on ECMO before they really thought she was ready. Even on really, really tough days he insisted that Clara was going to be fine. He was so optimistic and filled us with hope because he never gave up. We hadn't seen Dave in a long time and boy was it good to hug his neck again. Of course, there's Crystal. When we buzzed the bell at the unit, she's the one who greeted us saying, "They said that Clara was here and I said, 'MY CLARA?!'" Yep. She's yours, Crystal. Love you. Clara grabbin' Crystal's lip. (That's love). So, after our surgery appointment, and visiting in the PICU, we headed back to the NICU. Dr. Yang was the attending who cared for Clara longer than any other attending while we were in the NICU. We will forever be grateful that she was on call for so many days during our stay because she was the perfect fit for Clara and our family. I have so much respect for how Dr. Yang practices medicine. She's a brilliant woman, and she really knows her stuff, but she looks at the baby more than any other doctor I've ever known. 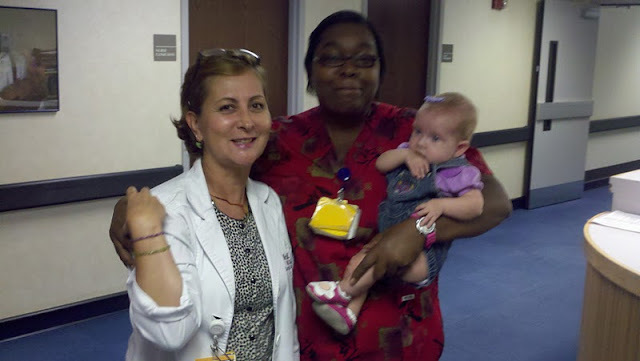 She never just relied on a report from a resident during rounds. She always wanted to see and touch Clara for herself, and she did - many times every day. She was willing to push Clara when she thought she could handle it, but was quick to back off if Clara said, "enough!" (I remember one day when we were trying to wean sedative and painkiller and I was so eager to get it off, but Clara was showing withdrawal symptoms and Dr. Yang quickly adjusted her doses, not wanting Clara to be uncomfortable or in any pain.) She is a phenomenal problem solver, always turning things over in her head over and over again until she's sure of a solution. Perhaps most of all, she believed in Clara. She's the one who let us give breastfeeding exclusively a trial run in the hospital, when that's not how they usually roll. She's the one who said, "Don't put a G-tube in! She can do it!" She's the one who knew that our family was going to do anything in the world we could to help Clara be the best she could be. 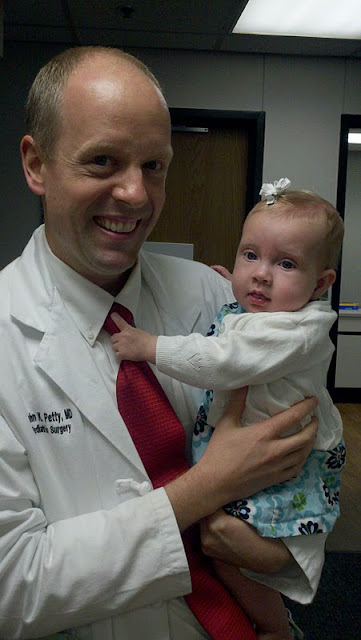 And she often affirmed our long days and nights in the hospital by saying that our time, love and attention were part of what was helping Clara defy the odds to heal so well. On our previous return visits to the NICU, Dr. Yang had not been there. So it did our hearts a lot of good today to see her and to let her love on a big healthy Clara. Because I trust and respect her so much, it meant a lot to hear her say how well she thought Clara was doing. I hope we'll stay in touch for many years and that she can watch Clara continue to grow and thrive. We love you, Dr. Yang! We also got to see Tara today. Not sure how we missed getting a photo with her! 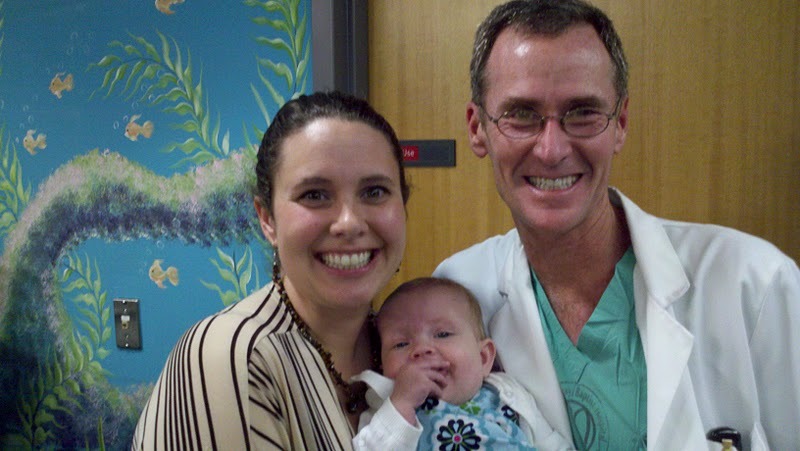 Tara had her own miracle baby just two months after Clara was born. She went to Boston and delivered a beautiful baby girl with a heart condition requiring immediate surgery. Georgia is thriving just as much as Clara these days! Her unique perspective was always reassuring to us. Can't wait for those two girls to meet someday. Of course, there were other people who we loved a lot and miss as much as these folks, but didn't get to see today. We saw Martha (the lactation consultant who was committed to helping Clara and me both learn how to nurse) and Wanda (the CNA who loved us like her own) on our last visit though. So, in case I haven't made it clear: it did our hearts good to see these folks. So, so good. Clara did have to get a chest x-ray before we left the hospital. By this point, it was nearly an hour and a half past her afternoon nap time and she was such an incredible trooper to still be hanging in there. 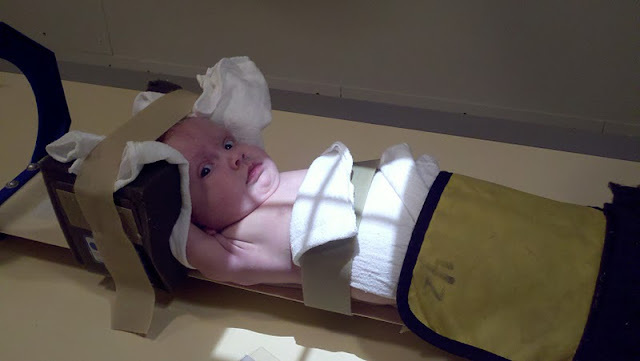 She was tired and hungry, but still let the x-ray tech strap her into this contraption for a few quick x-rays. She was within her right to scream and cry, and if she had, this would have been pitiful. Since she was instead looking at us like, "what the heck is going on here?!" it was just hilarious. Poor baby! It was great to be back at Brenner. And to all you other folks who we love and miss, but didn't get to see today, I surely hope we'll see you next time! It is so good to see Clara doing well. I love to check the blog for your updates. WOW! I KNOW all these folks were over-joyed to see a little miracle visit them today. Thank GOD for ALL of them and thank GOD for the happy Hardy family! I love reading this part of your journey - to read your heartfelt words that bring honor to al those who believed in Clara and did everything they could to enable you both to return to Brenners today for a happy, healthy follow up visit!!!! Beautiful. Just beautiful. Brings tears to my eyes. Thanks to all you wonderful folks at Brenner! Praise the Lord from the mountain tops and valleys! I know what a true joy it is for the staff who cared for Clara to see and hold her. It is the reason they continue to do what they do! You have a beautiful little girl! I am so happy to see she is doing well. I was not aware of your struggles; I just didn't see you at Shady Grove this year. 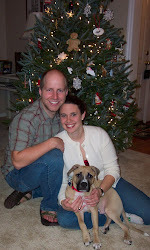 While skimming the blog, I saw that Clara and I share a birthday! I will say a special prayer for her on that day. I hope for excellent health and happiness from here on for you all. Jennifer Hire, Mason's mom. Such a heart warming day. It was good for us to "see" the members of Clara's team with her. Just look at the smiles on everyone's faces. Thanks for sharing. The X-ray contraption picture is priceless!! It is awesome that everyone got to see how great Clara is doing! I love how content she looks in all of the pictures! Every picture was a testament to so many who were part of Team Clara and to God, the Great Physician! I know I speak for so many who have been part of this Team by praying from afar that this report warmed our hearts and built our faith. My favorite pic was Clara's "what the heck look" in the x-ray contraption!